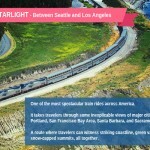 The journey on board the Coast Starlight from Seattle to Los Angeles is widely considered one of the most spectacular train rides across America. The train takes us through some of the most spectacular views of Portland, Sacramento, San Francisco Bay Area, and Santa Barbara. From the beautiful Pacific coastline to green valleys and fields and from the snow-capped peaks of the Cascade Mountain and towering cityscape, this is one journey that will keep you spellbound. The Adirondack is a daily train that leaves New York City’s Penn Station and heads north towards Montreal, just across the border. 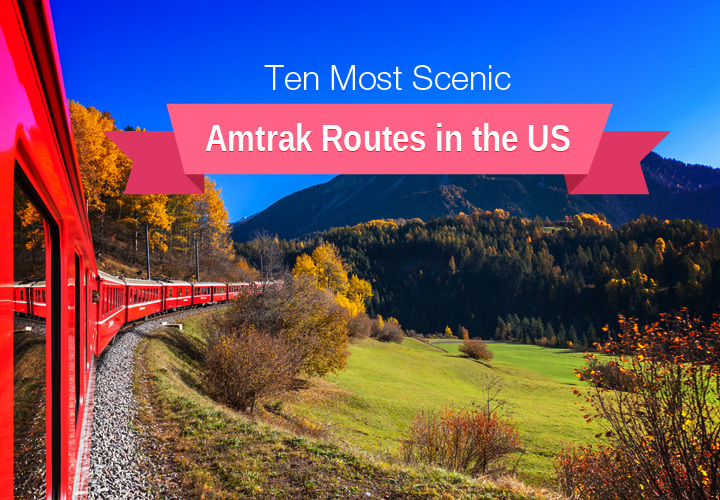 This is certainly one of the most scenic train rides that you can take in the US. Traveling through the lush Hudson Valley wine country and the countryside, this 11-hour train journey promises some very beautiful views. The stretch between Albany and Montreal promises much natural beauty. The rugged beauty of the landscape along Lake Champlain and through the foot of the Adirondack Mountains makes for a great trip. 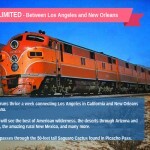 The Sunset Limited runs thrice a week and connects Los Angeles in California and New Orleans in Louisiana. 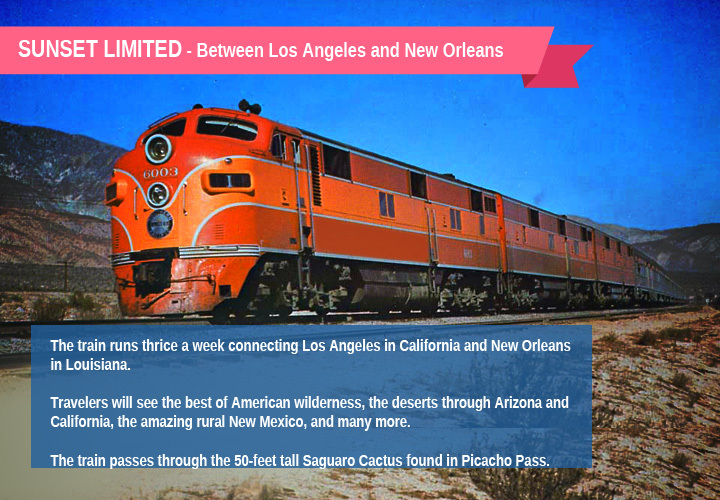 Taking us through Tucson, San Antonio, and Houston, this train journey showcases the best of American wilderness. 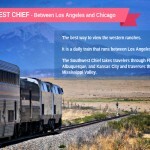 This train showcases the beauty of the deserts through California and Arizona, the best of rural New Mexico, and the understated splendor of Texas and Louisiana. 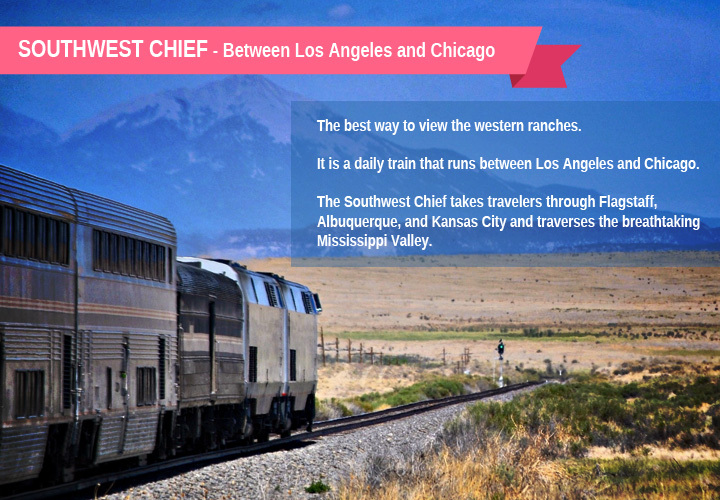 Southwestern US is known for its contrasting landscapes and Sunset Limited brings us the best of all the states it passes through. Look out for the 50 feet tall saguaro cactus found in Picacho Pass in Arizona through which the train passes. 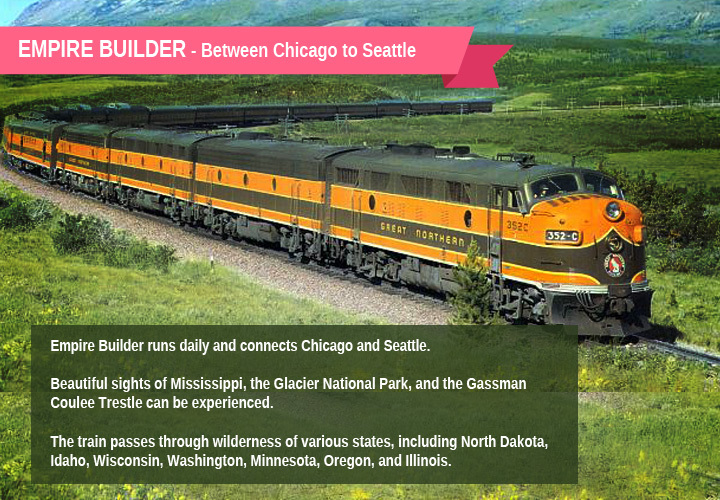 Empire Builder, the daily train connecting Chicago and Seattle is next on our list of most scenic Amtrak routes. Taking us through the beautiful sights of Mississippi, the sprawling plains of North Dakota, climbing across the Gassman Coulee Trestle, and passing right through the delightful Glacier National Park, this journey is one where wonders never seem to cease. The train passes through the wilderness of a number of states – Oregon, Washington, Idaho, Montana, North Dakota, Minnesota, Wisconsin, and Illinois – each sight more beautiful than the previous. The California Zephyr is the second longest train route served by Amtrak and one of the most beautiful train journeys in the US as well. 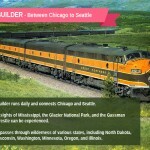 This daily train connecting Chicago and San Francisco goes through the Rockies, Sierra Nevadas, Moffat Tunnel, the canyons of Colorado, Winter Park, the banks of the Truckee River and Donnel Lake, and the San Pablo Bay. 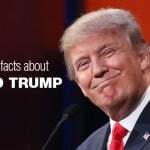 The sight of the snow-tipped Sierra Nevada, the glowing plains of Nebraska, the breathtaking stretch between the Rockies and Salt Lake City and the wonderful views of Reno before we get to San Francisco’s Golden Gate are all part of the journey’s charm. The Crescent is a daily train that connects the Pennsylvania Station in New York City with the New Orleans Union Passenger Terminal in New Orleans. Apart from the charming countryside, the Crescent also gives us a sneak peek into the breathtaking beauty and the mystique of southern America. 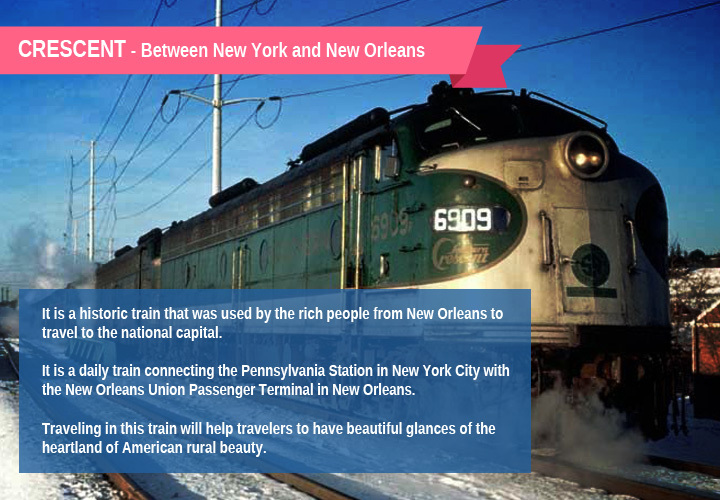 The Crescent is a historic train that was often used by the wealthy from New Orleans to get to the national capital. 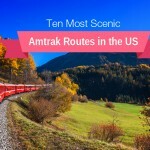 As it passes through some of the most scenic landscapes of Washington, Virginia, North Carolina, Atlanta, and Mississippi, this train brings us to the very heartland of American rural beauty. For those who are drawn by the unfathomable grandeur of the Grand Canyon, then board the Southwest Chief that runs daily between Chicago and Los Angeles. Taking us through Flagstaff, Albuquerque, and Kansas City, the Southwest Chief traverses the breathtaking Mississippi Valley. 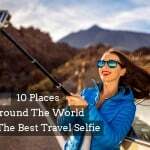 This is the best way to view the western ranches, the sprawling wheat fields, the very edge of the Grand Canyon, and through desert regions. Needless to say, the views are spectacular and this is promises to be one memorable train journey. 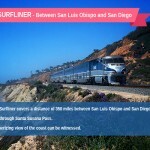 Covering the 350-mile distance between San Luis Obispo and San Diego, the Pacific Surfliner takes us through the most amazing places including Orange County, Los Angeles, Ventura, and Santa Barbara. 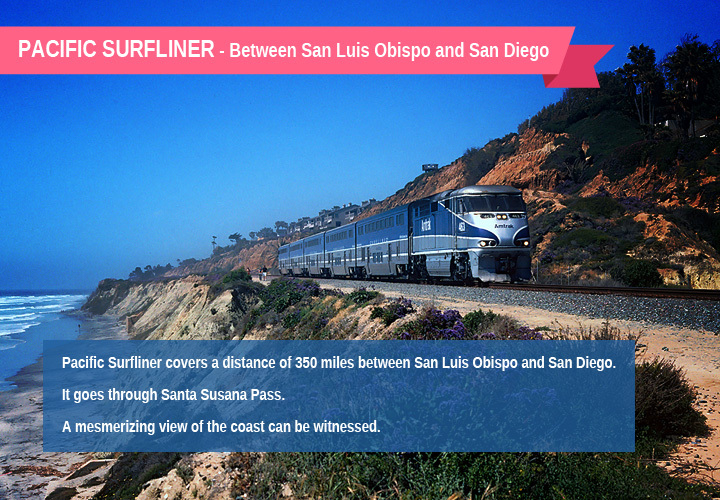 The greatest advantage of taking the Pacific Surfliner is the amazing views especially between San Diego and San Clemente. The sights as the train goes through the Santa Susana Pass are picture perfect. 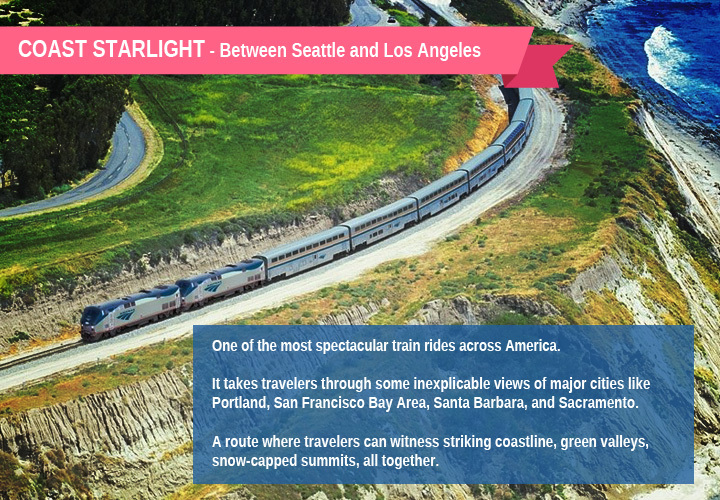 This train ride also offers breathtaking views of the coast. 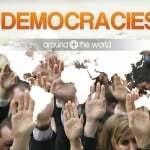 The services on board are great and most frequent travelers prefer the business class experience. Running daily through Pittsburgh and Cleveland, the Capitol Limited is one of the two Amtrak trains that connect Washington D.C. with Chicago. The train follows the historic Baltimore & Ohio (B&O) route through the beautiful Potomac Valley. After crossing the Harpers Ferry it traverses the foot of the Allegheny Mountains and takes us into Pittsburgh. Having crossed into Ohio state it takes a northern course into Cleveland, and finally to Chicago. Covering the distance in about 16 hours 45 minutes, the Capitol Limited takes us through some of the most beautiful parts of eastern America. Connecting the beautiful stretch between Philadelphia and Pittsburgh, the Pennsylvanian takes us through some of the most scenic parts of the state. 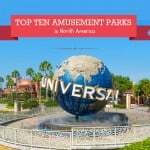 The best bits of this scenic journey include the sights of Pittsburgh’s Golden Triangle, that is, the confluence of Monongahela, Allegheny, and Ohio Rivers, and the majestic peaks of the Allegheny Mountains. Do not miss the famous Horseshoe Curve of Altoona in Pennsylvania and the picture perfect Dutch Country.